Made with a special blend of super soft nylon, the Vario 4 dog leashes are bound to make walks, play days, hikes, and every sort of adventure more enjoyable for everyone. Add a Tangle Free Double Dog Couple or LITE Coupler. 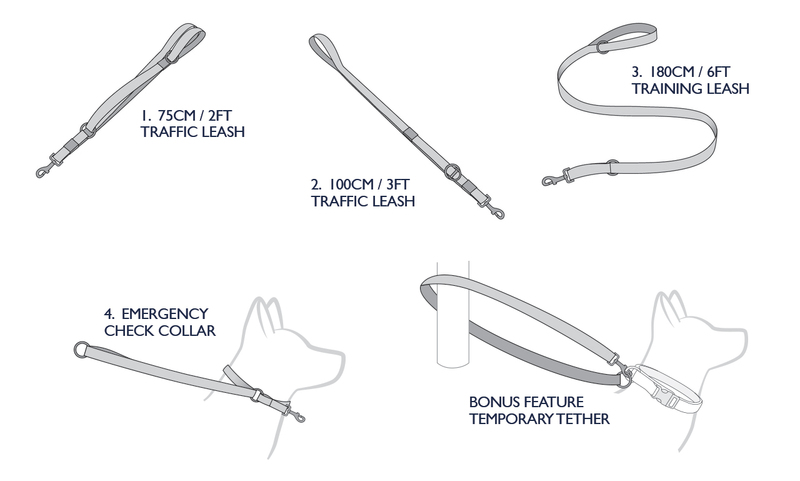 The Vario 4 Multi-Function Leash is so versatile it can be easily transformed into a temporary collar and leash, a dog tether, a long leash, or a short leash. Simply put - the worlds best dog leash. With one Vario 4, you can pack light and hit the trails or the streets carefree. 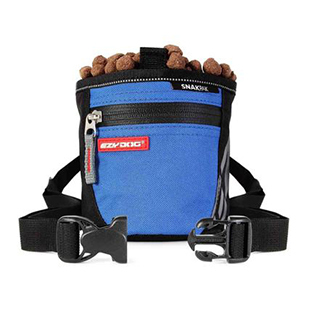 Whatever you need a leash for, the Vario 4 Multi-Function has got you covered. 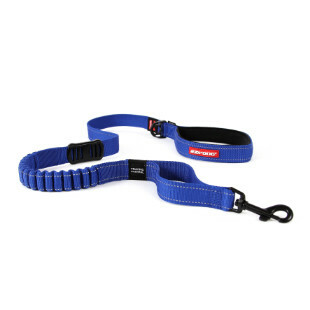 Don't forget to pick up a unique dog collar or a durable dog harness to go with your new dog leash from EzyDog! Now the little guys can cruise in style with the Vario 4 LITE. Developed from our successful Vario and Trainer collection, the Vario 4 LITE has high visibility light reflective webbing and is perfect for dogs under 26 lbs. Converts to a 3 ft. 3 in. traffic leash to a full 6 ft. lead in seconds. The emergency check collar conversion helps control those little guys in tight stations. At EzyDog we work to keep both you and your dog happy. The Vario 4 Multi-Function leash is more than just practical and cool. It is also designed to be comfortable and pleasant for both your dog to wear and you to hold. For our world wide dog lovers visit one of our international dog accessory online stores for your all your dog leashes, harnesses, collars and more. I love the simple conversion features from 6 feet to 3 feet and then 2 feet. It's great to know your dog is close by when she wants to greet people with excitement and holding her back is easier on the 2 foot conversion. I like it and will order more. EzyDog Says: Check out the Lite Version for webbing that is 1/2 the width. Thank you! Really like this leash. Provides the flexibility needed for my 20# PomChi. Provides me with emergency check collar when she is less inclined to behave, & provides shorter option for when walking in more crowded areas. Wish the lite version webbing was more cushioned version like the shock leashes. Just got Lite version today & we went for long walk to use all the permutations. Used all the options except tethering (won't use) & 3'5" Traffic option (shorter 2' better for my small dog). Really like that it is easy to move between all the configurations without unhooking leash while walking. Really like "emergency" check collar option for when pup is being over enthusiastic & can use for on spot training without having to carry special collars or treats. Was hoping webbing was was going to be wider, thicker, & softer (would be willing to pay more). I have the Vario 6 leash & the thinner webbing is fraying on the edges; will see how Vario 4 holds up. Like the Vario 4 better because it has a dedicated loop handle & is easier to hold. Vario 6 given it's different options will use it with seat belt in vehicles. Like the leash, especially since don't leash all the time! I own several of these leashes in blaze orange, red, and blue all are soft and easy on your hands. When my boxer mix rescue was ready for her own matching set I got her the pink camo. It was stiff and almost sharp on the edges. I thought okay maybe it will soften with time, it has not. The stiff texture makes it hard to control a large dog when she decides to act up especially while hiking with another larger dog. So because this color was such a disappointment I gave four stars instead of five. I like the versatility of this leash. It's very lightweight and easy to adjust from a long length to short to accommodate any situation. Well made .Provides security when walking my dog.Stylish.Only drawback is the high shipping charge.